IAM Midwest Territory General Vice President Philip J. Gruber presents IAM Local 837A, Hazelwood, MO, member Daniel Forbes a plaque and $200 check for winning the Midwest Territory Logo and Slogan Contest. 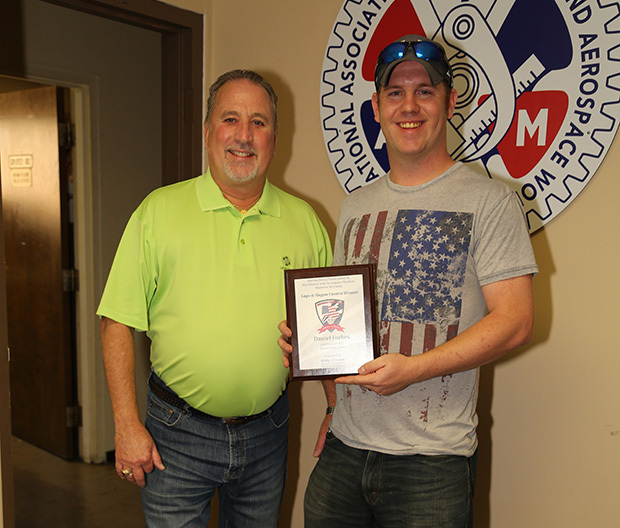 The IAM Midwest Territory congratulates IAM Local 837A, Hazelwood, MO, member Daniel Forbes on winning the IAM Midwest Territory Logo and Slogan contest. IAM Midwest Territory General Vice President Philip J. Gruber launched the contest in March 2016 in search of a logo and slogan that best incorporated the spirit of the territory’s 10 states, as well as the theme of moving forward as the territory works to organize and grow its membership. As the new trademark of the IAM Midwest Territory, Forbes’ design will be displayed on the territory’s organizing materials, webpage, social media, and other branding opportunities moving forward. A panel of eight judges reviewed each submission and chose Forbes’ logo and slogan by an overwhelming majority. Forbes, a nearly six-year IAM member and Local 837A Steward, works as an F-15 assembly mechanic at Boeing. The husband and father of two says he entered the contest because of his background in graphic design. Gruber met with Forbes to congratulate and thank him personally during a recent trip to IAM District 837 in Hazelwood, MO. As home to the winning submission, Gruber also presented IAM District 837 Directing Business Representative Steve McDerman with a plaque, thanking him for his leadership. As the new trademark of the IAM Midwest Territory, Forbes’ design will be displayed on the territory’s organizing materials, webpage, social media, printed materials, paraphernalia, and other branding opportunities moving forward. It will also be used to create a new territory pin.